We are seeking financial support for the campaign. You can help by making a contribution. In 2012, I personally financed my school board campaign. For this November, more resources are needed to reach voters with the message opposing to the $887 million bond, protection of Mello-Roos taxpayers, school choice, and quality school programs for our students. Each of us has a financial stake in the outcome of this election, as well as the success of our students. Please consider contributing here, or use the "Contribute $" tab at the top of this website. This evening, I went to the Registrar of Voters' office on South Grand in Santa Ana to complete my filing for reelection in November. This is what you call a "low-key" announcement. I'm running. A visit to the ROV is a sobering experience. People from all over Orange County gather in the lobby, filing to run in the upcoming election. Some are obviously experienced. Most are scared, lost and struggling with the process. The experience is instructive as to what voters can expect of government, and what they must demand. It's a slice of humanity. The ROV staff show remarkable patience, helping the newcomers through old requirements, and helping those with experience deal with the new requirements. It's a small staff, but OC voters should be proud of the work they do. Our ballot is important, and ROV staff is the thin line that separates an election from chaos. "So you pay your money and you take your chances." Unless you are willing to literally camp-out in the ROV lobby (not allowed), you can have no clear idea of what is happening in your race until the filing period ends on August 12 (or 17th, if no incumbent has filed by the 12th). In a school board race where no nomination papers are necessary, anyone can walk in and and file to place their name on the ballot. If they want a ballot statement (200 words), they must pay a substantial fee. But anyone can place their name on the ballot for nothing -- if they can find their way to this nondescript lobby on South Grand Avenue. At 5 PM, the lobby gets rather personal when the doors are locked. You meet interesting people, all who are waiting. Most are prospective candidates, though there are one or two handlers mixed in. The ROV staff assures you that you will be served, while excluding late-comers. They are well-organized and fair. They don't hurry. Advice is freely offered. Two hours after the office closed, my paperwork was complete. I, Jim Reardon, do solemnly swear that I will support and defend the Constitution of the United States and the Constitution of the State of California against all enemies, foreign and domestic; that I will bear true faith and allegiance to the Constitution of the United States and the Constitution of the State of California; that I take this obligation freely, without any mental reservation or purpose of evasion; and that I will well and faithfully discharge the duties upon which I am about to enter. With that, it was done and I became an official candidate. This was also a moment to reflect on my past four years on the Capistrano Unified School District Board, and as co-founder of the Capistrano Taxpayers Association. Did I live up to this oath in my public roles? Did we? I have had "mental reservations" throughout my life, but not about this. Evaluation of my performance at Capistrano Unified is a matter best left to voters who will examine my record of the past four years. 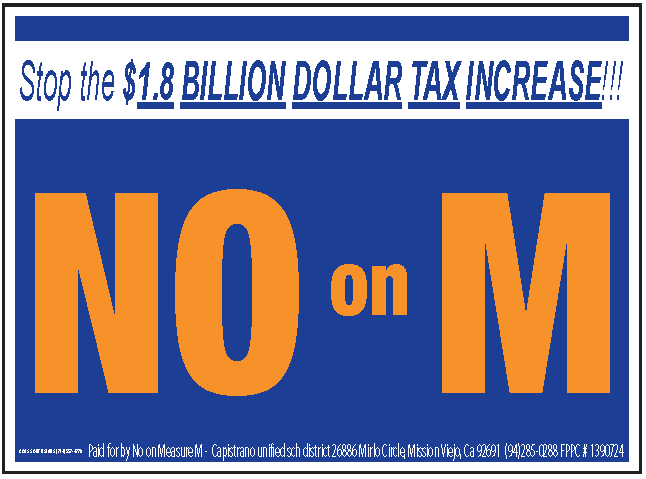 At Capistrano Taxpayers Association, with the support of neighbors, volunteers defended Article XIIID (Proposition 218) of the California Constitution in court, where it was confirmed that municipal utility charges (e.g. water) must be cost-based and cannot be used to disguise taxes that have not been approved by voters. Too bad for San Juan Capistrano, but a big affirmation of constitutional government in California! In truth, all citizens are embraced by this oath, even if few hold public office. It is a matter of pride in country and faith in our future. Tomorrow is the last normal day before the filing deadline for the November election. The CUSD Board will decide Wednesday whether to put an $889 million district-wide bond on the November ballot to fund facilities improvements. I am opposed to this idea, though I have voted to recognize that there are needs in facilities across the school district. This whole idea got off to a late start and then took a bad turn because we are too close to the election deadline. I favor breaking the district into smaller tax rate zones based on various factors, including age, Mello-Roos patterns, city boundaries, and then proceeding zone by zone (not all at the same time). This is no longer an option for November, so others are seeking a shortcut, i.e., to "force it". I firmly believe we need to put it off and work to get the structure right. 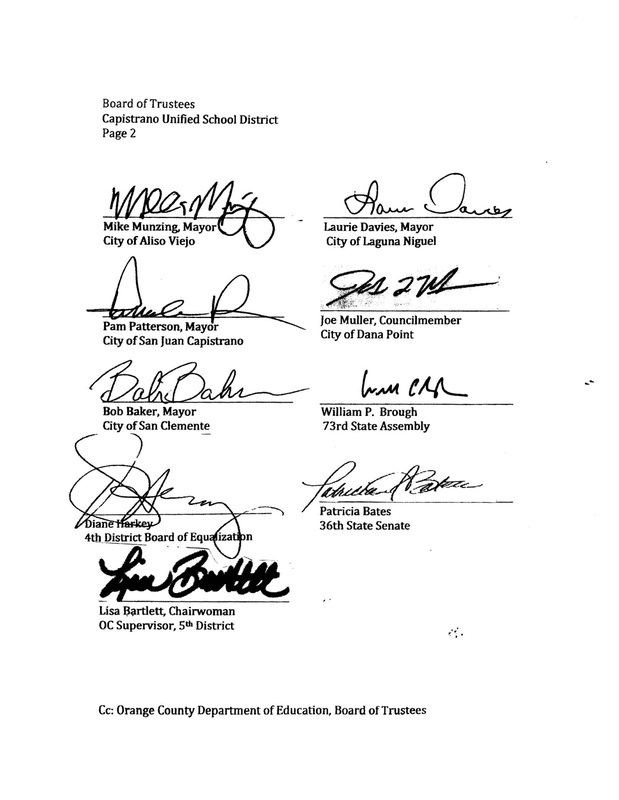 The mayors of all of our cities along with Senator Pat Bates, Assemblyman Bill Brough, SBOE Member Diane Harkey, and Supervisor Lisa Bartlett all oppose the bond in the form being considered. 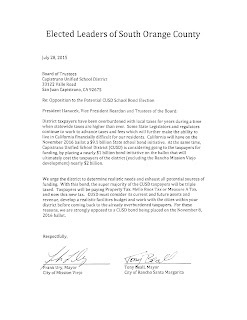 I believe that if CUSD places this bond on the ballot, there will be a ugly and divisive fight in the election that will take us back to the days of trouble in CUSD's recent past. These memories remain fresh for many people. The setback of a November ballot measure, regardless of outcome, will take decades to overcome -- if it even can be. The term of this bond is 25 years! 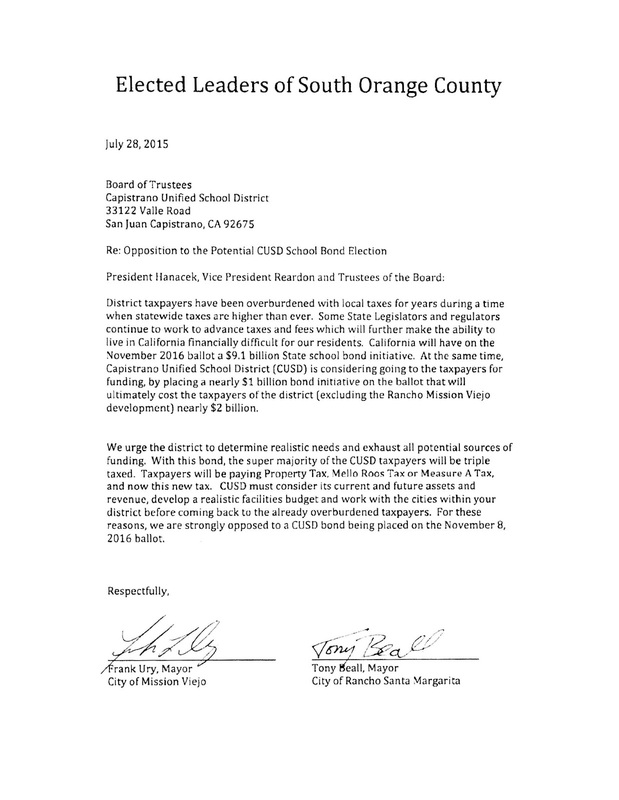 Some people hold the opinion that CUSD is too large to govern effectively. At least one area (SC PIER) is actively seeking to succeed and form their own school district. Top-down governance simply won't work in South OC. A enlightened approach is needed, one that is sensitive to unique needs, history, and trajectories of our communities. Wednesday, August 10. I will be voting "no" on the bond, yet I still hope it doesn't have to come to that. 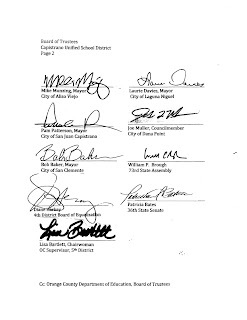 Mayors who signed the opposition letter are Frank Ury, Mission Viejo, Tony Beall, RSM, Mike Munzing, Aliso Viejo, Mayor Laurie Davies, Pam Patterson, San Juan Capistrano, and Bob Baker in San Clemente. Councilman Joe Muller signed for Dana Point. The mayors are backed-up by votes of council members. In Mission Viejo, unanimous opposition from Wendy Bucknam, Greg Raths, Ed Sachs, and Kathy Schlicht. In Laguna Niguel, Jerry Slusiewicz, Gary Capata, Elaine Gennawey, and Fred Minagar spoke in opposition to the bond in during agendized council discussion. 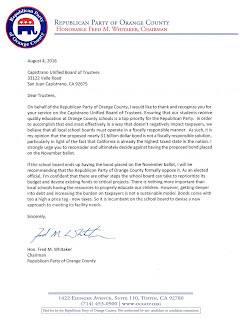 On August 4, OC Republican Party Chairman Fred Whitaker separately wrote to Trustees to urge they not place this "$1 billion" bond on the ballot. 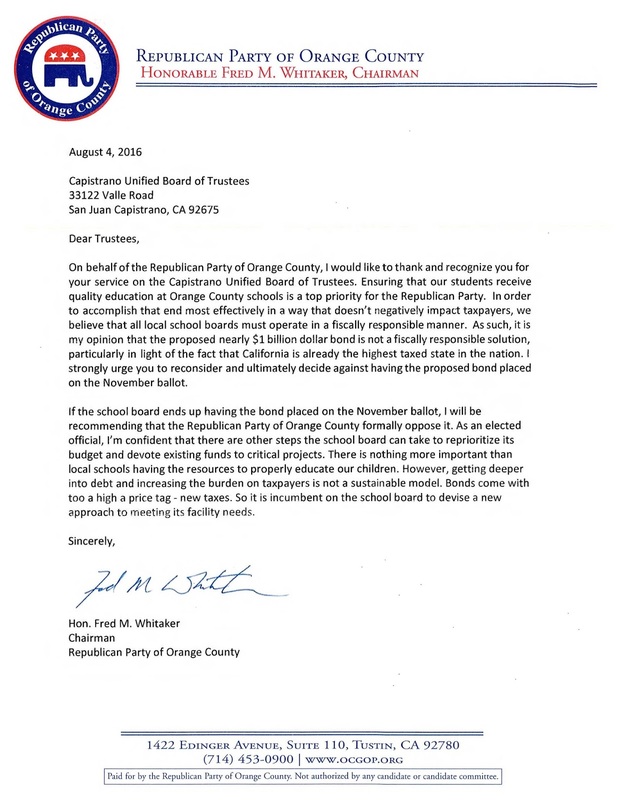 He went on to say that if the measure did end-up on the ballot, he would recommend that OCGOP formally oppose it.